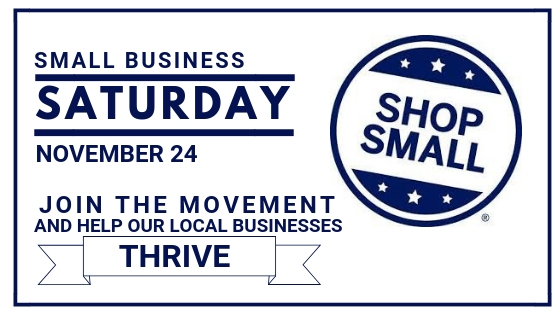 Small Business Saturday – November 24th! With Thanksgiving this week, the biggest shopping season of the year is set to begin. Why not shop local? Small Business Saturday is Saturday, November 24, 2018. Better yet, make a weekend of it! Doylestown is calling it Small Business Weekend and is full of events all weekend long, Friday through Sunday! * Fantastic discount offers, unique and one of a kind gifts, and a festive holiday atmosphere. * Friday, November 23rd – The 104th Christmas Tree Lighting. Entertainment starts at 5:30 PM followed by Santa lighting the tree! * Santa will be in his workshop for visits and pictures all weekends. * Visit Superior Woodcraft between 10 am and 2 pm. For details, hours and more info, visit the Discover Doylestown web site. In 2010 American Express started the “Small Business Saturday” campaign, encouraging shoppers to visit and shop at local, brick and mortar businesses for their holiday shopping needs. Now, only eight years later, it has become an internationally recognized day. Whatever you have planned for the rest of the weekend – holiday decorating, shopping, visiting family – we encourage you to remember to shop small, shop local, and buy American. Your participation will create a positive impact within your community, you’ll be making an economic investment in your community. Best of all the entire family can have fun at the same time. When you’re shopping at local businesses this weekend notice how many local businesses support their community – youth sport programs, local charities, 10k races, town parks/recreation areas and more. Without the support of these local businesses many of the amenities that you enjoy in your town wouldn’t exist. Shop Local Independent Companies, support your community and say thanks to the local business owners for all they do. Superior Woodcraft salutes and thanks all of its fellow local independent business owners for growing our local economies and keeping America strong.